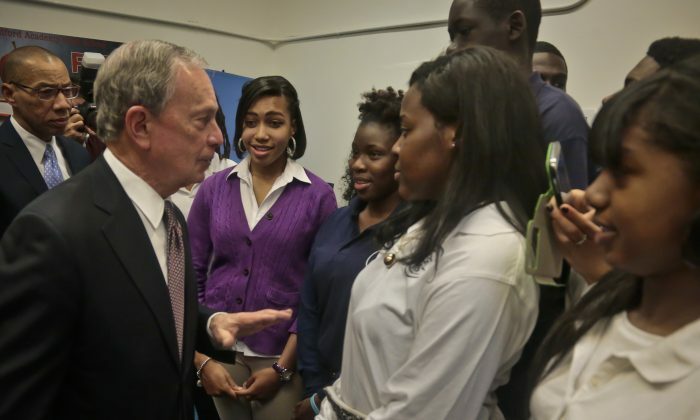 NEW YORK—Mayor Michael Bloomberg announced Tuesday that high school graduation rates in the city were at an all time high of 66 percent. The mayor, accompanied by Schools Chancellor Dennis M. Walcott, made the announcement at the City College Academy of the Arts in Upper Manhattan. “I think [the rise in the graduation rate] shows further evidence the incredible progress that New York City students are making and the success our school reforms have had in transitioning and transforming an educational system that was once a case study in dysfunction into one that’s reaching new heights of achievement every year,” said Bloomberg. According to preliminary figures, the graduation rate for the 2012–13 school year was 66 percent. Eight years ago, when the state first began releasing city graduation rates, it was just 46 percent. Black and Hispanic students made the most progress. Graduation rates increased by 53 percent for black students and 58 percent for Hispanic students. In addition, dropout rates decreased by half since 2005. Of the students who graduate, more are prepared for college than before. In 2005, 32 percent of students graduated college-ready compared to 46 percent in 2013. The College Readiness Index looks at SATs, ACTs, and CUNY Assessment tests. “So when people say, ‘Oh, more are graduating but they’re not ready for college,’ that’s not true,” said Bloomberg. One of the major reasons for the rise in high school graduation rates, according to the mayor, is the improvement of elementary and middle school education, which lays a good foundation for new high school students. Currently, 22 out of 25 top performing elementary and middle schools in the state are in New York City. Twelve years ago, there were no schools from the city on that list. He attributed the overall progress to several strategies implemented by the city’s Department of Education that include creating more and smaller schools focused on college prep, and establishing the school accountability system. In the system, schools are graded according to academic performance and school statistics are available to the public online. In less than a month, Bloomberg will hand over the city to Bill de Blasio, who has very different ideas about education reform.